This is the spacious Jeep Cherokee Laredo. Enjoy this 4-door rental vehicle with room for 5 passengers. The exterior is stylish and the interior is well designed also. The average mileage for the Laredo model-Jeep Cherokee is 20 MPG. Standard amenities including 17-in steel wheels, LED daytime running lights and taillights, Bluetooth connectivity, cruise control, a 5-in touchscreen display, an SD card reader and a 6-speaker audio system with an auxiliary input jack. 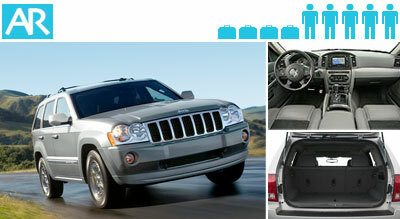 Jeep Cherokees and Jeep Wranglers are in high demand, especially in the Winter and Summer months. We recommend booking early to avoid hassles. All Jeeps include unlimited mileage.